Sound seems dominated by a smooth character which may, for some listeners, prove something of a handicap to appreciating the good insight and tonal balance of this generally fine player. 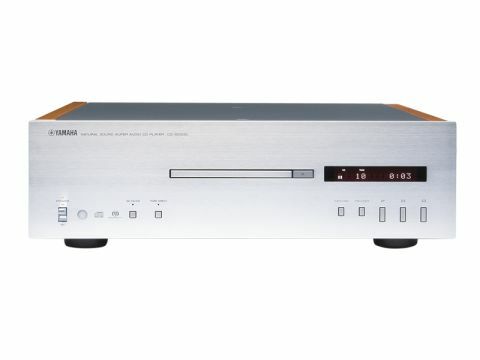 Having got back into stereo hi-fi with enthusiasm, after a brief period when its dedication seemed to waver, Yamaha has produced quite a range of separates among which this CD player and its matching amp (A-S2000) are currently, it tells us, 'Pre-Eminent'. In appearance, both units are remarkably similar to the '1000 models. Indeed the similarities go deep and one could, with some justification, regard this as a 'Special Edition' CD-S1000. The SACD transport is the same, while the power supply is not quite the same. The S2000 has a deluxe arrangement with two transformers, one toroidal and one frametype, which keep the analogue and digital sections separate right back to the mains. The audio board is shared with the '1000, but in this case some spaces left vacant in the cheaper model are populated with components to drive the balanced output, which is, of course, doubled by the usual phono sockets. Components on the audio board are in some ways an odd mix. The DAC chip is a thoroughly modern device capable of handling both PCM (CD) and DSD (SACD) datastreams in their native format with excellent performance, but it is followed by analogue circuitry based on an op-amp from the 1970s and passive components which could have come practically out of the ark, all mounted in an old-fashioned through hole manner, the resistors standing up as they did in those well-loved Yamaha amplifiers and cassette decks of pre-CD days. Operation is fine, although like all SACD players, it's distinctly on the slow side with disc loading. Something of a mixed success, this player impressed on grounds of bass and also of smoothness, a quality that is very much a question of taste. It does have its place, though and the Bach cello/piano track was well served by it, the intricately interweaving lines flowing naturally and clearly without any undue roughness to the sound. Funnily enough, The Mavericks also seemed quite well flattered here – their sound may be bright, but it is actually quite civilised and a smooth approach is sympathetic. In both those cases, the good tonal balance achieved by this player was appreciated and conducive to easy unravelling of the music's textures – if one chooses to listen that way. Of course, smooth presentation also allows more 'passive' listening with practically any music: there's less likelihood of anything startling or disturbing! The problem really is that some music does need a bit of an edge to it in order to work most effectively, and (assuming the performance and recording haven't already smudged that) equipment like this that takes some of that edge away is doing the music something of a disservice, especially for listeners who are sensitive to that kind of thing. One member of our listening panel is particularly sensitive to it, and for his ears, this player was simply too relaxed to appeal. His colleagues certainly spotted the smoothness, but were clearly far less perturbed by it, one finding the player overall quite exciting, the other having mixed feelings. There is some good timing and rhythm in evidence and dynamics work well in a slightly understated way – one doesn't always notice that music is getting loud until it really is, just like real life. Treble is decent rather than superb, but midrange is impeccably neutral and detail and imaging are good too. A fine player, just not one for all tastes.